Purchased from the artist by Friedrich Bienert, Dresden; Bienert family; (Dr. Fritz Nathan and Dr. Peter Nathan, Zurich); purchased December 1964 by Mr. and Mrs. Paul Mellon, Upperville, Virginia; gift 1983 to NGA. Provenance from donor's records in NGA curatorial files. Munich, 1925, no. 27, repro. Dresden, 1929, no. 385, repro. Paul Klee. Uomo, pittore, disegnatore, Complesso del Vittoriano, Rome, 2004, no. 79, repro. 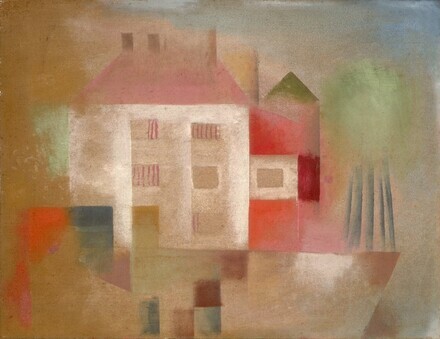 Paul Klee: Tempel / Städte / Paläste [Paul Klee: Temples / Cities / Palaces], Saarlandmuseum, Saarbrücken, 2006-2007, no. 66, fig. 116. Modernism: Designing a New World 1914-1939, The Corcoran Gallery of Art, Washington, D.C., 2007, no cat. Wickenhagen, Ernst. Geschichte der Kunst. Berlin, 1932: 353. European Paintings: An Illustrated Catalogue. National Gallery of Art, Washington, 1985: 216, repro. The Paul Klee Foundation, Joseph Helfenstein and Christian Rümelin, eds. Paul Klee: Catalogue Raisonné. 9 vols. New York and London, 1998-2004: 4(2001):159, no. 3386, repro.